Last week, I was contacted by Janet. She's a fellow thrift store picker who learned about the popularity of BeyBlades after reading about the toys on my blog. Using this knowledge, she then wisely scored a huge lot of Beyblades for only ten bucks at her local thrift store. After inventorying her mega score, Janet contacted me to ask how she should go about listing them on eBay? If you're not familiar with them, Beyblades are basically spinning tops on steroids. They come with a launcher and ripcords which shoot the Beyblade into an arena where they do battle with a fellow Beyblades. I've blogged about Beyblades in the past, pointing out that they sell for big money on eBay. After congratulating Janet on her mega score, I advised her to check other auctions on Ebay in order to get some ideas on how to list them. I added that taking plenty of photographs was important, since it gives bidders the opportunity to look over the toys. Janet followed these steps, posting her Beyblade lot in a seven day auction with a confident starting bid of $49 dollars. She also provided me a link to the listing. This way, I could watch the bids roll in. The only problem was...there were no bids! I have to say, I was more then a little surprised. Like a coach watching his player on the field, I nervously paced the eBay sidelines while Janet's auction sat dormant with no bids. As the days ticked by with still no bids, I wondered what was going on? Sure, I know buyers often like to watch an auction for a loooong time before bidding, but kid's toys are usually different. Kids have no patience-they bug their parents to get the bidding started! I began to wonder what the problem was? Did the bottom drop out of the BeyBlade market? Had the Beyblades craze end without anyone informing me? Whatever it was, the auction dragged on. Day five of the auction came and went with still no bids. Things were getting worrisome-the Dude's reputation was on the line here! It's sort of embarrassing when you tell folks that something is a big seller...then that something doesn't sell. Talk about getting egg on your face...I was ready to break out the washrag! I couldn't agree more with Janet's positive outlook. (Especially the part about eating popcorn in a movie-I MUST have movie popcorn too!) But fortunately, Janet didn't have to settle for just covering her costs. It took a while, but after a long wait, Janet watched three eBay bidders battle it out for her Beyblades. When the battle was over and the dust settled, Janet's Beyblades sold for an incredible $76 dollars! After the auction ended, Janet contacted me again to say thanks. (Which was very nice of her.) She also told me something very interesting, pointing out that her auction had over 350 page views. An awesome auction for Janet and a testament to Beyblades continued popularity. Congrats to Janet on a great score and an outstanding profit of $66 dollars. That should pay for a lot of movie popcorn! When you see Beyblades...buy em!!!! Have you flipped any Beyblades, or similar toy? Share your story in the comment section below. In my town, the start of the garage sale season began last week. Overall, I'd have to say it was a pretty good opening day. What started off as three sales, turned into more, as I came across a few bonus sales not listed on Craigslist. I did better then expected. In all, I bought four things, and oh yeah, I made one return. You read that right. I actually returned something to a seller only hours after I bought it. It's the first time I've ever made a garage sale return. Although I'll admit it's unusual to return something to seller, you'll see why I did it after I share the story. metal locomotives for sale. 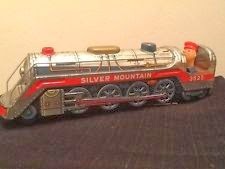 They were battery operated tin toys made in Japan and sold back in the Fifties and Sixties. I've had some decent luck flipping the old tin toys, including a Sixties era rocket ship I bought for a buck and sold for $90 smackaroos! With the memory of that great score in my head, I was definitely interested in the trains. The trains were identical, measuring a foot in length. Holding them up to the seller, I asked what he wanted for them? He took a long drag on his cigarette, then puffed out, "Gimme $50 for both." I then asked a very important follow-up question. Did they work? He assured me they did, laying out a long-winded story about how he owned the trains since he was a kid and adding he took excellent care of them. He even got into an elaborate description, promising me that the trains blew smoke when they operated. (I'd later find out who really was blowing smoke.) As I continued to look the trains over, I began the dance, asking if he'd take $40 for the pair? He countered with $45 adding, "That's a bargain, they go for a lot more then that!" First of the season finds! Once home, the moment of truth had arrived. I unwrapped the trains and retrieved some batteries to test both out. Gently slipping in the batteries, I closed the compartment door and flicked on the switch. Guess what happened next? Dead silence-I got nothing! No light, no wheels moving and definitely no smoke that the seller had bragged about! Although things were starting to look bleak, I still had one more train that could salvage the deal. I went through the same drill and turned on the switch. Once again-nothing! I stared at the trains in frustration. For the sum of $45 bucks, I was now the proud owner of two hunks of worthless tin! As I said earlier, I've never asked a seller for my money back. After all, it's not like I bought the trains at Sears or Walmart. Everyone knows that garage sale purchases can be risky. But this garage sale purchase was different. The guy not only assured me they were working, but he went into this big elaborate story about the smoke puffing out the stack! Worst of all, his bragging that the $45 dollar price tag was, as he said, "a bargain" was now burning my biscuits! I decided I wasn't going to be stuck with this almost $50 dollar "bargain." The trains were going back. Arriving back at the garage sale, I found the seller lounging comfortably in a soccer chair. I decided my plan of attack would be to start off friendly, raising the attitude only if he gave me some resistance. Fortunately, the guy was cooperative. He tried to feign some mild bewilderment over the fact that the trains didn't work. He even tried to get me to bite on the idea of a half price refund, suggesting I keep the trains. I didn't take the bait though. Even at twelve dollars a piece, the broken trains were no deal, much less a bargain. After returning my hard earned cash, I suggested to the guy that he look into having them repaired. He agreed, but I am sure he won't pursue that angle. My guess is he just put the trains back out on his table to sell. Hopefully, he told any potential buyers that they weren't working. It was an interesting start to the garage sale season. But despite the train deal that almost went bad, I still scored some other awesome finds that hopefully will be blog-worthy in the near future. How's it going so far for you? 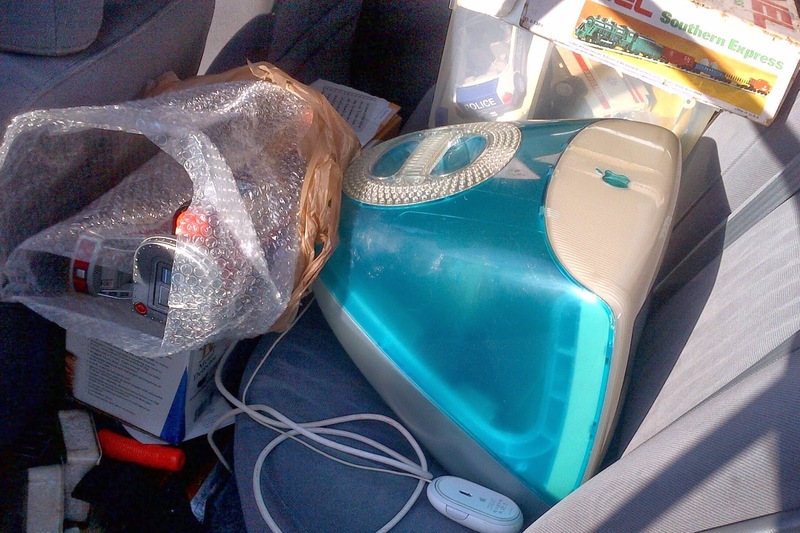 Have you ever returned something you bought at a yard sale? Share your "deals gone bad" in the comment section below.